Here’s an update on transport. We feel it is important to inform you up front about how transport takes place and what you can expect, in terms of support as well as delivery times, by our transport partner UPS. In Europe, the iStill 50 is shipped in three parcels and by truck. One parcel can arrive a day or two ahead of the others. In general, shipping takes between 10 and 15 days. There’s no track & trace for this service. To the rest of the world, iStills 50 are shipped – again, in three parcels – by airplane and then truck to your doorstep. Shipping takes usually less then 10 days. One parcel can arrive ahead of the others by a day or two. There is a track & trace service on this kind of shipment, but since shipping is so fast, we usually only get track & trace numbers after the unit is already delivered to you. Pretty much the same here. The only difference is that the iStill VISION comes in two bigger crated boxes. The iStill 250 comes in a crated pallet that’s sized 110 x 90 x 110 centimeters (L x W x H). The iStill 250 is transported to your doorstep via airtransport and then truck. Transport takes around 10 days (clearing not included). As with the iStills 50 and VISION that we ship by airfreight, officially there is a track & trace service. Again, in practice, we get these numbers by the time the unit is actually delivered. 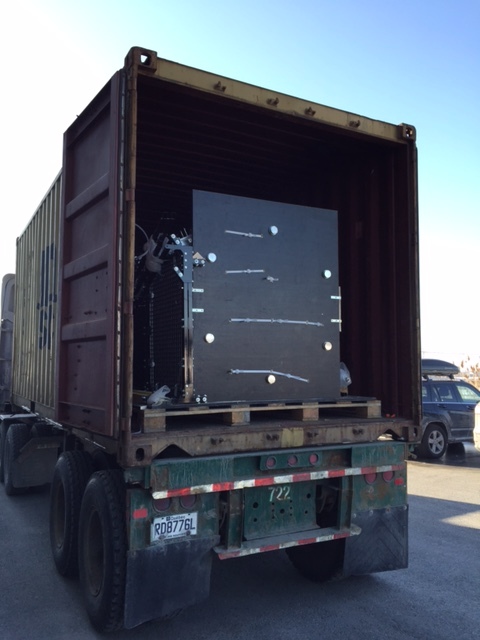 The iStill Masher, iStill One, and our fermenters are shipped by sea container. Time at sea is between 14 (USA and Canadian East Coast) and 50 days (Australia and New Zealand). The bigger units are shipped to a sea port of your choice. Usually the one closest to you. The client is responsible for delivery from sea port to the adress of the actual distillery. Now, and this is important, we need correct customer contact information. On you and on your clearing agent (recomended: UPS). And please know that UPS will contact your clearing agent 10 days prior the date the sea container with your equipment disembarks. UPS will contact your clearing agent 5 days prior to that arrival. The iStill 250 as well as our bigger units need to be cleared by customs when delivery takes place outside of EU territory. In order to get that done (paper work! ), you need to hire a clearing agent. The costs are usually between $ 150.- and $ 250.-. Off course, you are free to choose whichever clearing agent you want, but we strongly advice you to contact the UPS Center in your State or Country about it. UPS clearing a UPS transport goes so much easier and smoother, is our experience. Thanks, Great explanation of the process!